Draped along the greatest heights of the Himalaya, the kingdom of Nepal is where the ice-cold of the mountains meets the steamy heat of the Indian plains. It's a land of yaks and yetis, stupas and sherpas, some of the best trekking on earth and the closest thing that backpackers have to Disneyland. Ethical Trekking Nepal will take you on the adventure of your lifetime, while the money you spend benefits orphaned and abandoned children. We are a small and friendly Nepali agency, based in the beautiful town of Pokhara in the foothills of the Himalayas. We provide tailor-made treks, tours and sightseeing all over Nepal and as far as Tibet and India. Guests are welcome to visit our home stay in Pokhara, at the Children's Home that Ethical Trekking Nepal supports. We hope you will enjoy finding out more about the opportunities we have to offer and we are looking forward to plan your trip! Krishna made my trip to Nepal. From the moment I stepped from Kathmandu airport I was made to feel at home. The warmth of his character and his instant friendliness soon made us close friends. The depth and variety of his knowledge never ceased to amaze me and keep me entertained; he looked after me so well and on the occasion that I became unwell, I was particularly impressed with his sensitivity to my condition. My time with Krishna will always remain in my heart and I cannot recommend him more highly as a travel companion. 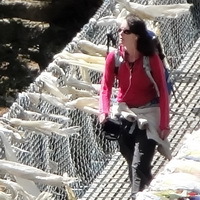 Why Choose Ethical Trekking Nepal? We pride ourselves in offering a personal, friendly and meaningful experience. We want you to have the holiday you want and we will work it out according to your preferences, time, budget, etc. Let us take care of the details to give you an enjoyable and stress-free experience. Krishna Dhai (older brother) is a motivated, passionate man with a kind heart and a cheeky smile. I met Krishna on my second visit to Nepal. Over the 3.5 months that I was living in Nepal I formed a deep trust with Krishna and also had a lot of fun, particularly scooting around town on the back of his motorbike while running errands for the orphanage. Krishna will continue to do great things in life; he is a true inspiration. 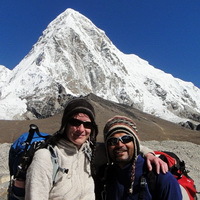 Krishna's knowledge of trekking is amazing and was very helpful for when I went trekking to Annapurna Base Camp. He was too busy with his work at home to come trekking but organised a guide/ porter for my father and I. When we both fell ill before our trek Krishna came to visit us to make sure we were okay. I will return to Nepal one day to trek with Krishna. With a sweet, caring disposition, a great sense of humour and a positive outlook he is everything you want from a guide... and a friend. Thanks Krishna! 100% of the profits we receive from your holiday will go directly to Shangri-La New Dawn Children's Home. Which is a small, loving family for 11 orphaned and abandoned children from across Nepal. Once begging on the streets, living off rubbish dumps or working as servants, these beautiful children now have a second chance in life through an education and training. Our vision is for them to return to their original communities to provide the help they need, in professions such as medical professionals, social workers or teachers. Whilst, Shangri-la New Dawn Children House is supported by MDMAM - Cassie and personal donations, contributions from Ethical Trekking Nepal are a fundamental part to the home becoming self sustainable. 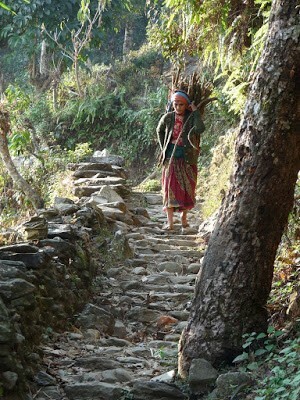 Shangri-La New Dawn is run by Krishna, who also manages Ethical Trekking Nepal. "Main Dans La Main autour du monde-cassis" is an NGO based in Cassis, France. MDMAM provide funding and training to local humanitarian projects while upholding a profound respect for the local culture, religion and tradition. MDMAM Association was created to provide adequate and sustainable solutions for the poorest populations. Set up in 2004, after a partial activity of 8 years and on the eve of a trip of 27 months. We encourage a discussion on humanitarian aid, take time to observe, discuss and understand why and how to help? Empowering the best people to give them autonomy and management of their future projects. We have different projects around the world and Shangri-la New Dawn Children home is one of the supported subjects in Nepal. Knowing Krishna from 2006, we have decided to fund the Shangri-la New Dawn Children Home Since 2009. Our motto and aim for Ethical Trekking Nepal could make Shangri-la self running in the near future and give opportunity and job to our children. If you are interested to know more about us, please don't hesitate to contract us. As we are not young, by his knowledge of walking in the mountains, we could go without any problems to our destination. We have easily been to Mustang/Mukthinath trek without any problem in our second trekking in Nepal and had a great time. Krishna is like our son/brother and without fear, we could go anywhere in Nepal. We trust him and decided to support Shangri-la and big family. Guests visiting the Annapurnas are invited to stay with Shangri-La Family before and after trekking. 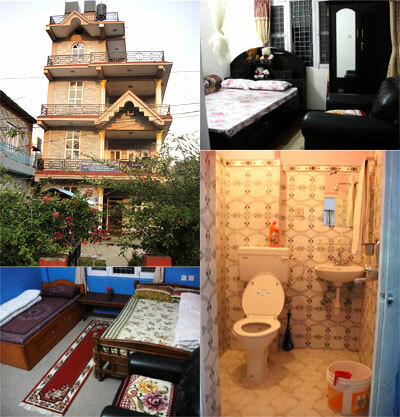 We offer home stay accommodation with four comfortable rooms (3 with attached bathrooms) and delicious, Nepali style meals. Krishna and his family would love the opportunity to get to know you and the children are delightful company! For pictures and more information, please see next section - Home Stay. With nearly two decades experience in the trekking industry, Krishna Acharya is heading the team with his down-to-earth organisational skills and hearty sense of humour. He will plan your holiday and if he is unable to be your guide he will pair you up with another member of our friendly and capable team. Staying at Shangri-La Children's home really made an impression on me, and I surely will not ever forget it. A big part of the experience was being so warmly received by Krishna and his family. It was a "home away from home" feeling. I loved the kids, and it was incredibly sad to leave them! 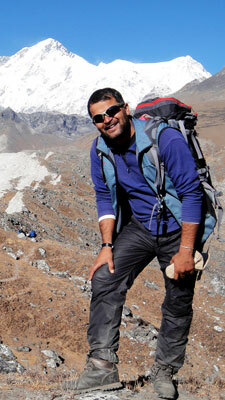 Krishna is an expert at making trekking trips, and when he is your trekking company one feels safe and protected. He has a good mood and will always do his best to make you have an unforgettable nature experience. I hope I'll visit this wonderful family some other time in life. Shangri-la New Dawn Home Stay offers guests a wonderful chance to experience everyday Nepali life and culture. Shangri-La New Dawn Children's Home offers four comfortable guest rooms (3 with attached bathrooms) and delicious, Nepali style meals. Those visiting the Annapurnas are invited to stay with Shangri-La Family before and after trekking, or whilst sightseeing in Pokhara. Meet the children your money will be supporting! There are a total of 13 beds and guests are welcome to stay for any amount of time up to a month. Facilities include free Wi-Fi and solar hot water. 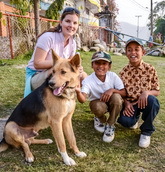 Shangri-La Children's Home is run by Krishna, who also manages Ethical Trekking Nepal. 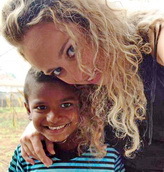 To find out more about the Children's Home, please see About Us - Help Orphaned and Abandoned Children. It was a pleasure for me to build this website for you - man of a big soul. I like the way you treat and help children from streets as well as your life attitude and diligence. 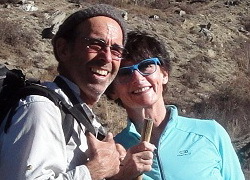 Together with Jana we spent wonderful holiday in Nepal and enjoyed our stay in your home. It is by chance that we met, by choice that we became friends. Thank you very much for everything, I wish you all the best! Krishna, take care of your lovely family. I will never forget and wish to visit you again one day. 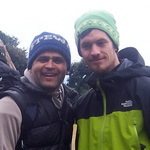 - David Novak (30), Czech Rep.
Krishna Kaka (uncle) is not only our guide through Himalaya, he is a gentle soul that we've met in our past life, at least that's what we think. What we admire the most from him is his passion, and of course his radiant eyes that is full of life. Almost every aspect of his life is driven by his passion. He is the kind of person who could jump through the hill only to be able to say that he loves you. His passion on humankind is the force that lead him to become a guide, and later on Coordinator in an orphanage. He will not stop by introducing you to his mountain, he will go further until suddenly you realize that you have been in love with the country itself. And then he will send you back to your real life with a pocket full of love and believe, that a journey through the Himalayan is merely a way to regain your believes in others. We offer wide palette of services including planning and support for mountain trekking, organized tours and variety of activities. Underneath follows the table of common treks in three world famous regions, which are well described, having carefully prepared itinerary. However, we are open to consult any specific requests and ready to prepare the trip right according to your needs. I just loved my stay at Shangri-La! Krishna and his wife Bishnu took such good care of us and it was really relaxing there. You feel like you are a part of the family, the children are great and the food is tasty. Krishna came with us on one trek and helped us organize another. He knows everything about trekking and Nepal! He is also great company, always with a smile and a funny story. We laughed a lot! I will also never forget his scary stories around the fire place late at night... Krishna and his familly will always be in my hearth and I truly hope to get back there someday soon. This is a short day trek from Pokhara, during around 5 hours, that combines a beautiful mountain panorama, a Buddhist temple and boating on the Phewa Lake. 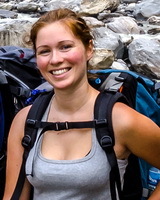 A day trip with a guide with packed lunch and water included. 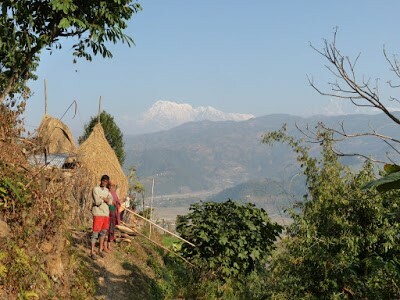 Throughout the journey one can get the great opportunity to see Himalayan view of Mount Dhaulageri, Annapurna 1 and Manasulu with experience of traditional and cultural local village life like Pheme and Pumdi villages. This is a paradise for nature lovers and the perfect place to come and relax after trekking. Over 50 species of mammals, 450 of birds and 67 of butterflies live in the 932sq km of forest, water marshes and grassland. Spot tigers, leopards and rhinos as you ride an elephant through the jungle, and paddle down a river to see crocodiles and dolphins. Meet baby elephants at the elephant breeding centre and learn about the original Tharu culture at the cultural show. 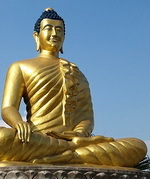 Visit the birth place of Lord Buddha, and relax in the peaceful surroundings. Marvel at the impressive architecture and enlighten yourself with yoga and meditation at a place of pilgrimage for Buddhist as well as reverence for peace lovers of any religious faith throughout the world. At the beginning of my first trekking in Nepal, Krishna was my trekking guide, but after three weeks I have left Nepal and Krishna as a good friend. I have to thank him, that he has made this amazing experience possible - I had the chance to see Nepal and its people from a very closed point of view. He was always willed to fullfil my wishes and his humor was good encouragement at the various steps (Namche, Tengboche, Lobuche, etc.). For detailed description please visit our separate sightseeing page. You can click the itinerary of your choice for detail information. The combination of any Tour itineraries with other adventure itineraries are Tailor made to suit your interest, time, and budget. Hence we welcome your inquiries for any combination or individual itineraries. 1. day Arrival at the airport and Transfer to Hotel. Sight seeing at Kathmandu Durbar square and Living Goddess Kumari's house. 2. day Sight seeing at Pashupati Nath, Bouddha Nath, Swoyambhu Nath, and Patan Durbar Square. Evening: drive to Nagarkot for sunset view and stay in a resort. 3. day Sunrise view, after breakfast, drive to Bhaktapur Durbar Square for sight seeing, drive to Kathmandu and transfer to hotel. Evening: farewell dinner with cultural program. 1. day Arrival, transfer to hotel, Sight seeing at Kathmandu Durbar square and Living Goddess Kumari's house. 2. day Sight seeing in Pashupati Nath, Bouddha Nath, Swoyambhu Nath, and Patan Durbar Square. 3. day Fly/car/ tourist coach drive to Pokhara, hotel transfer, Leisure walk along Phewa lake and boating dinner at lakeside. 4. day Sight seeing in Pokhara valley including Begnas lake. 5. day Sunrise and mountain view from Sarangkot hill from 1600m. Lunch at lake side and sight seeing to Hemja Tibetan Refugee camp and then visit depressed bard communities in Hemja. 6. day Visit the "World Peace Stupa" Lunch at lakeside and fly to Kathmandu. 7. day Departure from Kthmandu Airport. 1. day Arrival and Hotel Transfer. 2. day Pashupati Darshan and Sight seeing in Kathmandu in a coach. 3. day Bus drive to Pokhara and Hotel transfer. 4. day Helicopter flight to Mukti Nath. Darshan, flight back and Pokhara sight-seeing from a coach. 5. day Bus drive to Kathmandu and free time for shopping. 6. day Airport transfer and departure. 1. day Arrival, Hotel Transfer, Sight seeing at Kathmandu Durbar square and Living Goddess Kumari's house. 3. day Sunrise view, after breakfast drive to Bhaktapur Durbar Square for sight seeing, drive to Kathmandu and hotel transfer. 4. day Fly/drive to Pokhara, hotel transfer, Leisure walk along Phewa lake and boating. 5. day Sight seeing and visit "World Peace Stupa"
6. day Sunrise and Mountain view from Sarangkot hill. Visit depressed Bard Culture and typical local culture in Hemja village and visit Tibetan Refugee Camp to see Buddhist culture and Tibetan handicrafts. 7. day Fly/drive to Kathmandu and Hotel transfer; Evening: Farewell dinner with cultural program. 4. day Drive/fly to Chitwan, Hotel transfer, and Jungle safari activities. 5. day Drive to Chitwan National Park . 7. day Airport transfer and departure. 4. day Afternoon fly to Pokhara, Hotel transfer, Leisure walk along Phewa lake and boating. 5. day Sight seeing in Pokhara visit the "World Peace Stupa"
2-3. day Trips to various temples within Kathmandu Valley. 5. day Drive/fly to Chitwan, Hotel transfer, and Jungle safari activities. 6. day Jungle safari activities. 7. day Drive/fly to Pokhara, Hotel transfer, Leisure walk along Phewa lake and boating. 8. day Sunrise, Sight seeing and stay. 9. day Drive/ Fly to Kathmandu and Hotel transfer; Evening: Farewell dinner with cultural program. 10. day Airport transfer and departure. 3. day Drive/fly Chitwan, Hotel transfer, and Jungle safari activities. 5. day Drive/Fly to Pokhara, hotel transfer, Leisure walk along Phewa lake and boating. 6. day Sight seeing and visit The "World Peace Stupa"
9. day Airport transfer and departure. 8. day Sight seeing and visit the "World Peace Stupa"
9. day Sunrise and Mountain view from Sarangkot hill.Visit depressed Bard community and typical local culture in Hemja village and visit Tibetan Refugee Camp to see buddhist culture and Tibetan handicrafts. 11. day Airport transfer and departure. 15. day Airport transfer and departure. Thank you for everything, Krishna, Bishnu and all from Shangri-La New Dawn Children's Home! You all made our trip! Hope to see you soon! - Jana Kocianova (31), Czech Rep.
Do not hesitate asking if you have any questions, feel free to contact us and we help you as much as we can. Will you join our international friendship of people who care about nature and future sustainability of turism development? © 2019 Ethical Trekking Nepal - www.ethicaltrekkingnepal.com. All rights reserved, webdesign novaNet.